At Votary we couldn’t love flannels more. 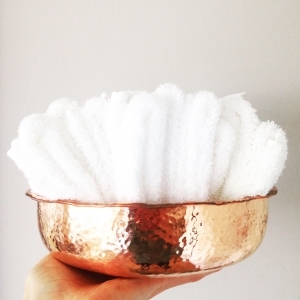 Every one of our beautiful plant oil cleansers comes with a white, soft, fluffy cotton flannel to help you clean your face properly. 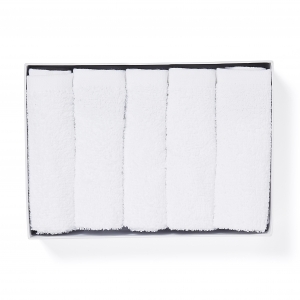 Flannels (face cloths if you are American) are a crucial part of the Votary 3 step routine. They’re brilliant multi-taskers. Firstly, when wrung out in hand-hot water and applied to your skin after cleansing oil, they bring steam and warmth to the mix. This helps your skin to release all the clogging grime of the day and maximises your Votary cleanser’s natural plant-powered potency. It also gives you time to relax, to enjoy the warmth and the fragrance, and to allow your mind to settle. It’s an uplifting moment of self-care. When you begin to wipe your face, a flannel helps to take off every scrap of make up and SPF. The soothing mechanical action also means any dead or compacted skin is gently exfoliated away, adding to your skin’s healthy glow. Flannels are also better for the environment because you can use them again and again, unlike daily wipes which are not recyclable and can cause real environmental problems. Flannels out-perform muslin cloths too, because they hold their heat and shape for more through exfoliation and are gentler on the skin’s mantle because they don’t become thin and scratchy. They can be washed alongside bed linen or towels, and ours remain soft and fluffy after repeated washing. And, what’s not to love about the note of chic luxury which a pile of freshly laundered white flannels brings to your bathroom game? So many Votarists asked us to produce a box of our flannels, so we did. Our five cotton flannels are made from pure cotton terry, and feel soft and luxurious on your skin. They maximise everything your Votary cleansers do to give you a healthy, radiant complexion. Read here to see how. And, if I still haven’t convinced you, here I am talking flannels in my bathroom! Looking for a retailer. Cheshire area. Thank you for your comment. You can either purchase directly from us on our website or I do believe Space NK have a store in Wimslow. It may be worth contacting them first to ensure that they stock Votary at that store. The number is: 01625 525 570 and the store is located at 11 C, Water Lane, Wimslow, SK9 5AE.